The history of the Irish troops at the Battle of the Little Bighorn in 1876. While Myles Keogh is a name familiar to many people, over 100 other Irish-born troops fought at the battle. This book is the first to tell their story. The life of John Barry, his role in the American Revolution and his reputation as the ‘Father of the United States navy’. The epic history of Irish involvement in the American Civil War. Around 170,000 Irish-born soldiers took part in the war. They fought and died for both North and South. The story of James Daly and the mutiny of the Connaught Rangers in India on hearing news of the continuing war in Ireland. The true story behind Michael Collins’s ‘Squad’ and all of the violence of Dublin’s Bloody Sunday in 1920 with new evidence on the killings at Croke Park. The history of the pioneering inventor John Philip Holland, the key figure in the development of the modern submarine and many of the world’s underwater fleets. The tale of British army officer John Henry Patterson who saw action throughout the world but who is most remembered for his exploits in Kenya during 1898. The relatively unknown story of the soldiers of the Irish Battalion in the Papal army who volunteered to fight in Italy during 1860. The history of the San Patricios, deserters from the US army, who fought for Mexico in the 1840s and who suffered an appalling fate as a result of their actions. 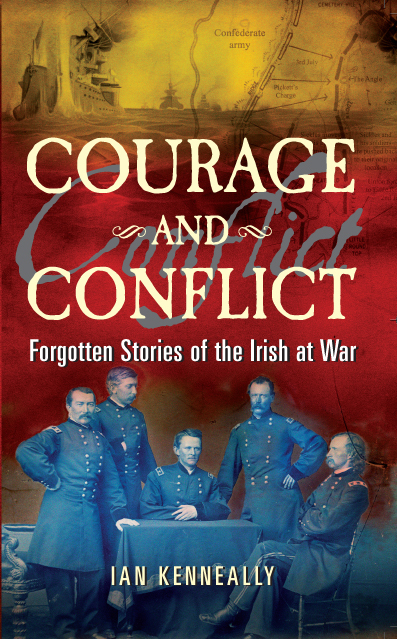 Ultimately, Courage and Conflict is a collection of stories on Irish people living through dangerous and dramatic times. These stories portray some of the triumphs and the tragedies, the heroism and the brutality, of the Irish at war.